Grab your fishing pole, your favorite lures, and a ton of sunscreen because we’re going to spend the week out on the Alexandria Chain of Lakes! We’ll spend time learning fishing basics and developing skills such as knot tying, casting, plus new tips and tricks on how to catch “the big one”. We’ll learn and grow together in a Christ-centered-fishy-smelling community! 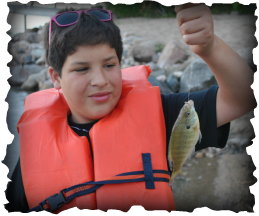 This program is limited to 16 campers due to boat availability. Because of the popularity of this program, two sessions will be offered and early registration is encouraged. Hiking. Canoeing. Biking. Faith. This week is truly a triathlon (and more) of fun outdoor recreation! You’ll begin the week hiking and geocaching at Lake Carlos State Park. The next few days are spent canoeing a section of the Crow Wing River and an afternoon on the SUP’s (stand-up-paddleboards) back on the shores of Lake Carlos. The final days of the week are spent on the Central Lakes Bike Trail where the group will bike from Alexandria to a few local communities. There might even be pizza and rootbeer floats at the end of the trail! We’ll also have plenty of time to swim, worship, and grow together as explore our summer Bible study. 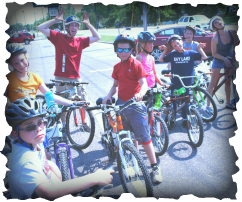 Campers will need to provide their own bike and helmet. Get ready for a fun-filled week of volleyball as we serve, pass, set, and spike our way through the week. Each day will consist of skills practice in Luther Crest’s indoor gymnasium under the instruction of a quality coaching team. We’ll also have plenty of time for jumping into the lake, diving into the Bible with new friends, camping out in tents under the stars, and worshiping at the campfire. The week will conclude with a volleyball tournament and a meet & greet with some area college volleyball players—who might even be on your tournament team! 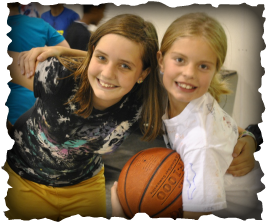 Expand your basketball skills and explore in your faith this summer at Luther Crest! Each day consists of multiple skills practices in our indoor gymnasium facility with the guidance of skilled and knowledgeable coaches. When not shooting hoops, we’ll be swimming at the beach, worshiping around the campfire, meeting new friends, and spending time with some silly camp counselors. We’ll wrap up our week with a co-ed basketball tournament, a chance to meet and greet some area college basketball players, and the summer musical! It’s time to get the fishing poles rigged up for a week on the water! 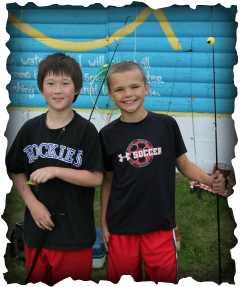 New to Summer 2014, Luther Crest is offering a Fishing Camp experience for older youth to continue to develop their fishing basics, grow in their faith, and explore new fishing spots! You’ll spend part of your week fishing the Alexandria Chain of Lakes. The other part of the week will be spent at Luther Crest’s Northwoods Outpost on Upper Gull Lake under the guided instruction of some local Brainerd area fishing experts. The week wraps up with a stop at the Minnesota Fishing Museum and a delicious fish fry! 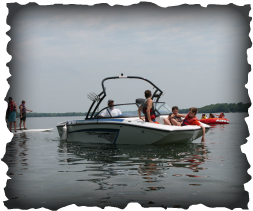 Spend your week on beautiful Lake Carlos enjoying days filled with wakeboarding, wakesurfing, waterskiing, and tubing. Building relationships with friends and camp counselors while learning how to SUP (stand-up paddleboard) and spending an afternoon at the water park. Dive deep into great faith talks, devotions, and worship. Enjoy challenge yourself on the climbing tower and zip-line, conquering fear, and growing in your faith journey!